Hicks Hiking: Kansas: There's No Place Like Home...? Kansas: There's No Place Like Home...? 1) Jake needs me to be ok, and to help him get ready for this. 2) We will be ok, we can do this. 3) God has a plan for us. Jake and I didn't get a chance to talk all day yesterday because he was flying and I was in meetings. When we finally did talk last night, this thought is where our conversation centered. God loves us. He has a plan for us, we just can't see it right now because we are disappointed that our own plans aren't going to work out. But this is our path, and we need to make the best of it...which, oh dear, actually means a TON OF WORK! So we better get cracking! 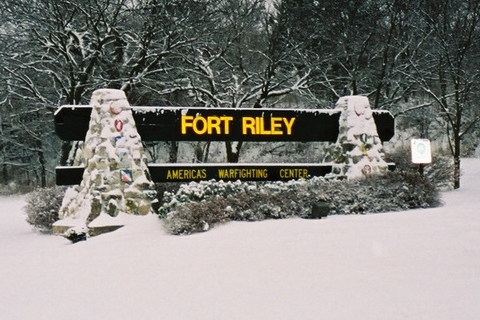 Jake has to report to work at Ft. Riley by December 6, which means out-processing from Ft. Polk two weeks before that so he can in-process at Ft. Riley before he starts work. And that means getting the out-processing process started in just a couple of weeks. That's just getting Jake ready to switch jobs. We also have to find Jake housing in Kansas. The fact that Jake is moving without us complicates things; despite the fact that it's actually pretty common now, the Army still doesn't handle geo-bachelors well, and his moving alone really precludes on-post housing from being an option for him. Fortunately, I have a wonderful friend who lived in nearby Manhattan, Kansas (the Little Apple) for many years, and she gave me some real estate contacts to follow up with for rentals in the area. We'll have to get some listings, get up there, find a place, and get Jake moved. And for our house in Louisiana, we have to finish the renovations on the bathrooms ASAP. We also have to find a leasing agent to help us get the place rented. We have to pack all of our things and get them moved out of the house, decide where everything is going (with Jake, to the Houston house, or into storage), and get it there. SO...the upshot, friends, is that we are disappointed, but we know it will be ok. Still, we have LOTS to do in the coming weeks, and we know our path won't be an easy one. We would really appreciate prayers, not only for a smooth transition, but also for our family in these two years that we will spend (mostly) apart. We love you, and we are really blessed to have all of your support.